You could wrap your body in an electric blanket, and you're still going to feel bad if your feet are cold and wet. It's the surest way to get sick and the worst way to spend a workday. 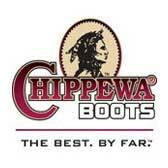 So wear these Chippewa 26341 Men's 8-Inch Bay Apache Brown Waterproof Insulated ... (see full details) (see specifications) #CHP26341. You could wrap your body in an electric blanket, and you're still going to feel bad if your feet are cold and wet. It's the surest way to get sick and the worst way to spend a workday. So wear these Chippewa 26341 Men's 8-Inch Bay Apache Brown Waterproof Insulated Steel Toe Logger Boots because they won't let your feet get cold or wet. The 8-inch uppers of these Chippewa boots are made with Bay Apache brown waterproof leather. That's a mouthful that means the material is soft and supple, easy to clean, and flexible around feet. It's waterproof, so it stays comfortable even in the rain and other ugly conditions when you wear these steel toe boots. Speaking of waterproof, insulated boots are lined with Chip-A-Tex waterproof booties. These thin membranes totally guard your feet against moisture. Maple Taibrelle lining surrounds the interior to keep the design feeling soft. Taibrelle is breathable material, because feet need air the same as they need warmth. The insoles of these safety toe boots are made with Texon. This is a non-woven material that gives feet both support and softness. To give feet additional support, the midsoles are made with a combination of 4 iron rubber and leather. This combination of shock-resistant rubber and impact-absorbent leather takes the pain and sting out of every single stride you make during those long workdays. By the way, those workdays feel a little shorter when your feet are dry as well as warm. The 400 gram 3M Thinsulate Ultra insulation is so light and thin it won't create bulk, but that doesn't mean you won’t feel it. Every time your feet stay warm and cozy on those cold days, you'll know it's working. Thinsulate absorbs body heat to keep you warm when you wear these waterproof boots. Your feet will stay warmer even in freezing conditions if you're working and staying active. Thinsulate is warm even when it's damp, so you know it's good stuff. Steel shanks create a core of support right at the heart of the design of these men's boots. These shanks give your feet lift to keep arches in place. This prevents muscle stain and pain that you get from walking and moving with work footwear that doesn’t offer support. Steel toe caps meet ASTM F2413-05 standards of impact and compression. That means it absorbs dangerous force from falling objects. With all those features, the design itself needs support. Vibram logger outsoles give it to them. The rubber soles absorb impact and bounce back from stepping shock. The Vibram tread cuts deep to give you grip everywhere you go when you wear these brown boots. Goodyear leather welt construction keeps the soles firmly attached to the rest of the design. Goodyear welt construction is glued first. This creates a cemented, waterproofing bond all around the sole of these steel toe boots. Then, the soles are stitched right to the midsole, through a thin strip of leather, with thread that's been waxed to resist wear and tear. These Chippewa 26341 Men's 8-Inch Bay Apache Brown Waterproof Insulated Steel Toe Logger Boots keep feet warmer, dryer, more comfortable, and safer. They do so much, they will literally carry you through the workday. Chippewa Boots: Men's 26341 Steel Toe Insulated Waterproof Logger Boots is being added to your cart.